It’s getting cold again, and that means its time for my favorite family of mixed drinks: the hot toddy. 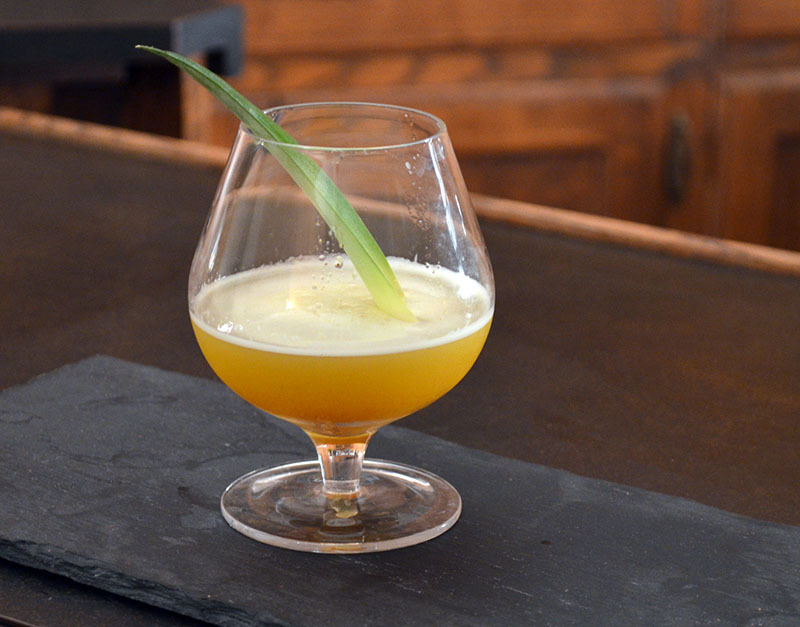 What is a hot toddy, exactly? For me it’s a feeling you get when it’s rainy and cold outside, and you bring a glass of steaming, aqueous whiskey to your lips. When it’s done right, it warms you to your core. And yet, the recipe is flexible. 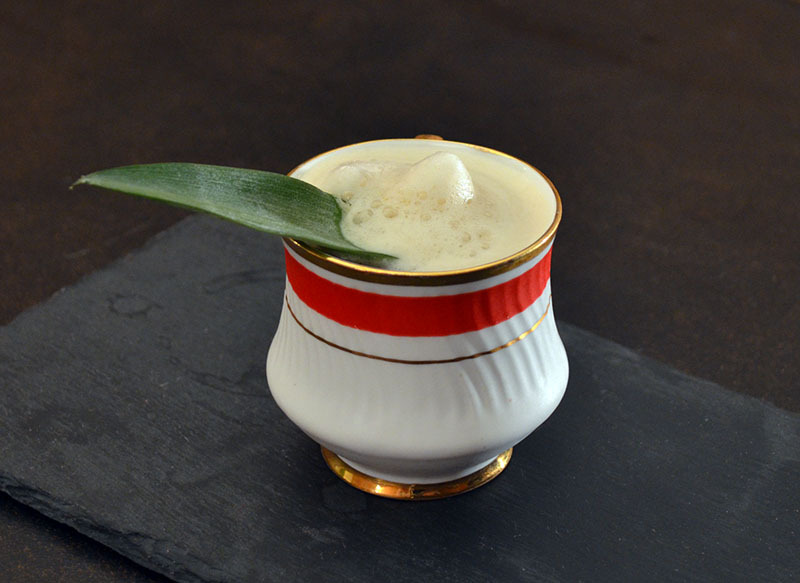 At its most essential, it consists of lemon, sugar, whiskey, and boiling water. That is a decent hot toddy all on its own, but it can be a bit plain. When I make it that way, I grate fresh cinnamon and nutmeg over the top, and garnish with a fatty orange peel. Today, I wanted to do something a little different. This is baseball-inspired hot toddy that I threw together on a whim. This follows my standard hot toddy formulation, which I will be expositing for you at some length over the next few posts. 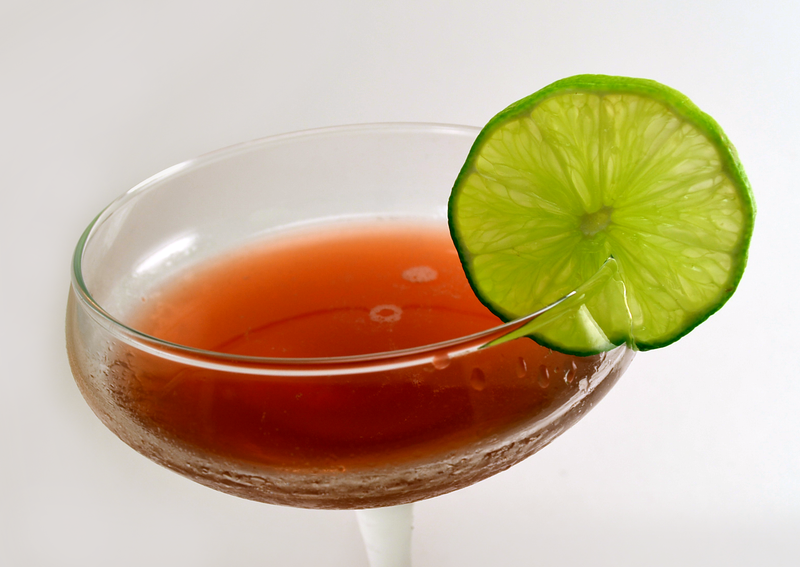 We start with a base spirit, and I chose to use Bourbon, because it is the all-American choice. I wish I could say it went deeper than that. In order to evoke the theme of baseball, I made a root beer syrup by boiling star anise, cloves, and sassafras in a syrup made with 1 cup of water, 3/4 cup of white sugar, and 1/2 cup of brown sugar. Brown sugar is not as sweet as white, but the syrup is still a little rich this way. I finished the syrup with citric acid, to balance the sweetness. In order to evoke popcorn, I lengthened this drink with 옥수수차 (Oksusucha) — Korean roasted corn tea. It doesn’t taste quite like popcorn, but it hits the right notes and joins the bourbon’s corn flavors to the sassafras’ herbaceousness. To finish it off, I rimmed the toasted peanuts, ground with salt and sugar to taste. I admit the rim was a little sloppy, but the oily peanut clumped in a way that was difficult to work with. Drying this powder out, either by letting it sit out uncovered, or (maybe? by mixing it with a bit of tapioca maltodextrin) would probably help it form a more consistent coating. Even so, it was delicious. Build the drink in a mug, finishing with still near-boiling oksusucha. Bring to a boil, then simmer for ten minutes, then strain. Finish with 1 tsp of powdered citric acid. When the drink was still piping hot, it had a bland flavor and alcohol burn. Once it cooled down to a comfortable temperature, the flavor was a bit muddy on the sip, but with pleasant roasty corn notes that gave way to a medium-bodied root beer finish. As the drink cooled, it became a little too sweet. 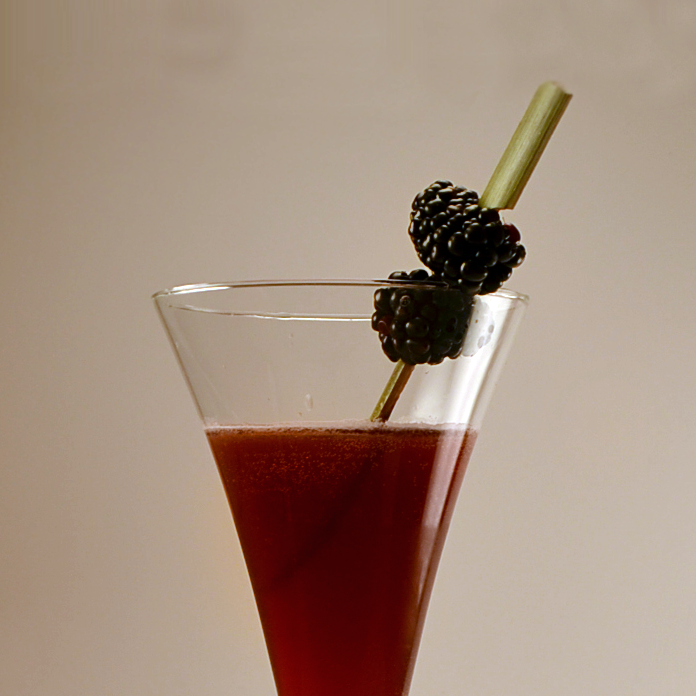 Categories: modern drinks, original creations, spirituality | Tags: baseball, booze, bourbon, cocktail, cocktails, craft cocktails, cubs, drinking, drinks, hot toddy, liquor, mixed drink, mixed drinks, mixology, oksusucha, peanuts, root beer, sassafras, spirits, toddy, vanilla, whiskey | Permalink. Next up in Measure and Stir’s Magical Mixological Journey in the Land of the Rising Sun(tm), we will take a quick detour to visit a couple of hotel bars. 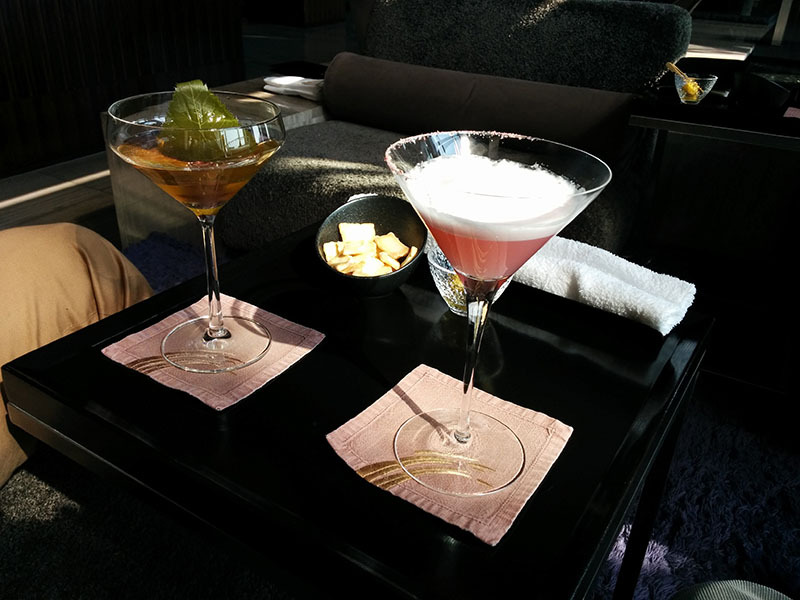 Located on the 37th floor of the Mandarin Oriental hotel in Nihonbashi, Tokyo, the Mandarin Lobby bar commands a beautiful view of the city, and the lounge decor and ambience are truly beautiful. That goes for the entire hotel, in fact. The lobby bar is richly adorned with waterfalls and ceiling-to-floor glass windows. It also has the virtue that it opens at 11 AM, so it can be a great respite from the chaos of the city below, even in the middle of the day. This was the second location that I found through the Serious Eats article, but unlike Gen Yamamoto, the drinks were nothing about which to write home (but wait, isn’t that exactly what I’m doing…?) Mandarin offered the full menu of classics that are standard to all Japanese cocktail bars, such as the Manhattan, Gimlet, Daiquiri, and so on, as well as a menu of house cocktails, and a small selection of tiki drinks such as the Mai Tai, Painkiller, and Zombie. The house cocktails were still painted with that particular seventies palette that contains liberal quantities of blue curacao, midori, and creme de cassis, but their two seasonal cocktails were interesting and unique enough that we ordered both of them. My drink was a Sakura egg white cocktail, and it contained gin, cherry blossom liqueur, egg white, lemon, and simple syrup. The egg white foam on top of the drink was extremely stable and frothy. It did not mix with the drink, and it did not break down at all. I did not get to see them make it, but I suspect the foam was added using an iSi, which in Japan is called an espuma. The flavor was light and pleasant. My friend Dave ordered a Champagne cocktail with shiso and light rum. The shiso flavor was very subtle, but the presentation was lovely. 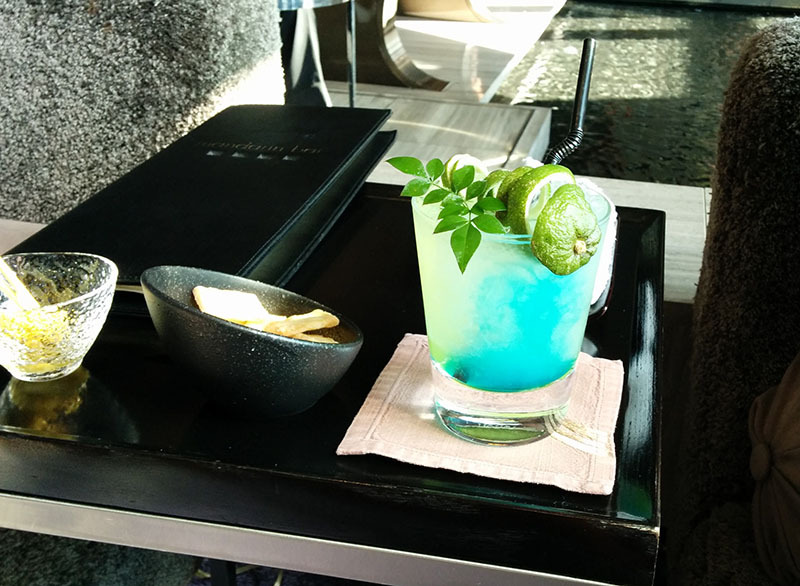 My friend Tom ordered some kind of grapefruit and vodka drink, colored with the ubiquitous midori and blue curacao. I don’t know if it was delicious, but it was beautiful. Dave finished off with a Halekulani, a tiki drink with which I was not familiar, but which used a bourbon base with lime, pineapple juice, and grenadine. This was my favorite drink at the Mandarin. If you find yourself here, my suggestion is to keep it Tiki. Although the Mandarin lobby bar is everything that you would expect from a world class hotel, I don’t really reccommend it as a serious mixological enterprise. This probably comes as no surprise to those of you who are seasoned travelers, but here at Measure and Stir we are committed to giving every cocktail bar a fair shake. 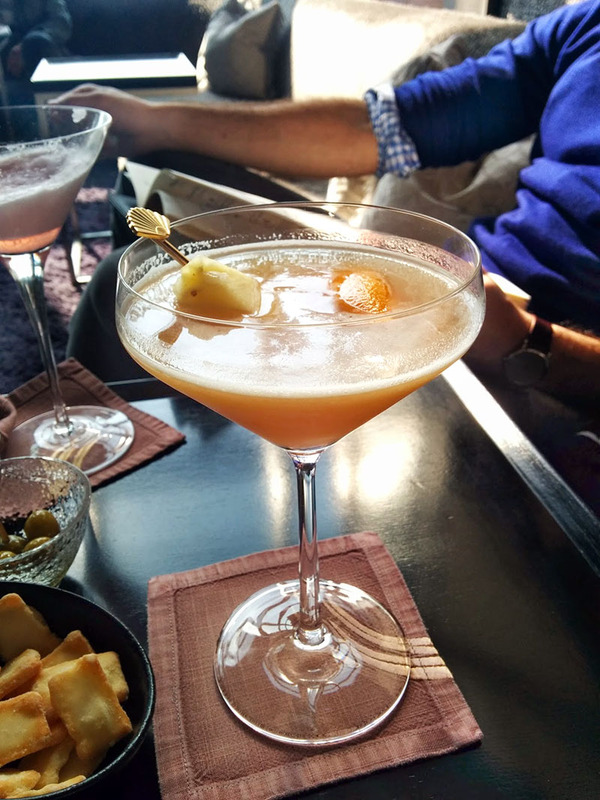 Categories: excursions | Tags: alcohol, bars, bartending, booze, cocktail, cocktails, craft cocktails, drinking, drinks, hotel, japan, mandarin, mixed drink, mixed drinks, mixology, nihonbashi, tourism, travel | Permalink.